Just like the title says. Also this is my first real post to oppo, previously I've only replied to others. And like my name says I'm an AMG technician. More specifically, I work at an MB dealer and my title is "systems technician, AMG specialist". In case you didn't know, not every MB dealer is an AMG dealer. For those of us who are, only two techs can be listed as AMG specialists. This means that I get to work on more than half of the AMG's that come into my shop. 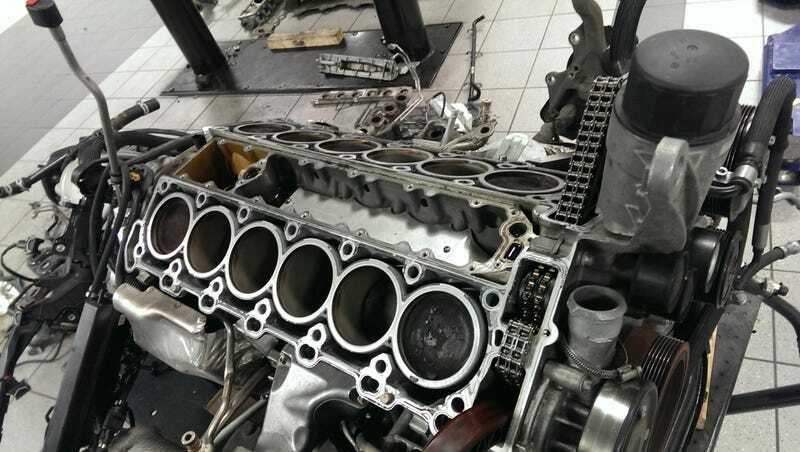 I'm currently right in the middle of a fairly large job, replacing the heads on a CL65, M275 twin turbo V12. What I believe happened is that somebody thought it would be a good idea to run e85 through it a few times, or some other caustic chemical. So the valves and valve seats are pitted, which caused low compression, which led to misfires and a check engine light. I'm not really one to take pictures, so I don't have that many. But I figured you guys would enjoy this!